David A Norris combined his expertise in Civil War history with his love of genealogy research to write Tracing Your Civil War Ancestors. Tracing Your Civil War Ancestors is a collection of resources, both well known and obscure, combined with ideas, hints and suggestions on where to research. Mr. Norris covers such topics as how to begin looking for a Civil War ancestor, how to find an African American Civil War soldier or sailor, finding records of Southern ancestors who served in the Union army. He also explains how to find and access Civil War records such as medical records, pension records, amnesty papers and Southern claims, income tax records, cemetery records, prisoners of war, newspaper records, 1865 Payroll List, NARA Civil War service records, and records from Soldiers, Sailors and Widows' Homes. I was really impressed with this work. The magazine looked professional and the cover photo of a Civil War soldier in full uniform made me want to read what was inside. It is an excellent resource for all levels, from the beginner to the more experienced researcher. While researchers might be able to find the same information by spending many hundreds of hours at their computers and in various repositories, Mr. Norris' 82 pages have very capably put it all together in one easy to read format. At $9.95 you can't go wrong. Are You Related to William or Kate? The Royal Wedding. Prince William today marries Kate Middleton. Geni.com sent a graphic which is very interesting, and gave permission to publish it here. I don't think I'm related to royalty but maybe you are! The Upper Canada Land Books do not, for the most part, contain much more information than the names of petitioners for land. However if you cannot find your ancestor in a Land Petition, you may find his or her name in the Land Books. Sometimes more detail is found in the comments section of the Land Book reference, but not often. Library & Archives Canada provides a list of microfilm reel numbers for both Upper and Lower Canada Land Books. There are four Land Books for Upper Canada (A, B, C & D) which are in chronological order from 17 February 1787 to 13 July 1798. Upper Canada Land Book C covering 11 April to 20 December 1797 has been indexed and abstracted and can be consulted online. There are also some out-of-order petition entries for June and July 1796 in this database. "Peer, Jacob - Praying for lands as a settler. Recommended for 200 acres." "Seeley, Rebecca - Praying for 3000 acres of lands in remuneration of her father's losses during the American war. The committee of Council are restricted from recommending lands as a compensation for losses, commissioners having been sent by His Majesty to this country for the especial purpose of remunerating the suffering loyalists. As the petitioner appears to have neglected this opportunity, the committee regret that they can only recommend her for 200 acres, if her father's name appears on the U.E. List." Remember - these are brief entries from the Land Books. 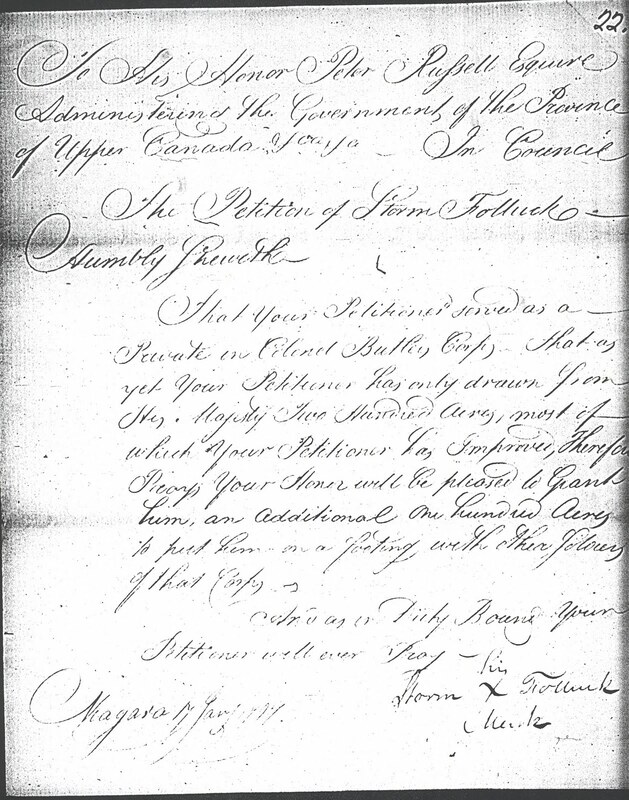 Petitions in the Upper Canada Land Petition files contain letters, affidavits, petitions, oaths of allegiance and more. CLRI (Computerized Land Records Index) (aka Ontario Land Record Index)summarizes land grants from sales of Crown Land, from Canada Company sales or leases and from Peter Robinson settlers' grants. If your ancestor settled anywhere in Ontario and he was the first time buyer of Crown Land, he will be on these lists. Loyalists were the first time owners of Crown Lands and thus are almost always found in the CLRI. The information from the CLRI one-line entry includes date of purchase, type of purchase, residence of purchaser, land location (lot, concession, township), type of purchase (very important to knowing whether or not there are more records available! ), archival reference (where full record can be found) and often more info such as date of land ticket, or date of petition for land, etc. A very poignant story has emerged about the identity of a young child aged about 2 years old, whose body was recovered when the Titantic sank. The child's identity was not known and he was buried in an umarked grave in Halifax Nova Scotia. Over the years different identities were attached to this child and published as fact but recent DNA extraction has proven with 96% accuracy that the child was 19-month-old Sidney Leslie Goodwin from England. A pair of brown leather shoes helped substantiate the identity. Little Sidney was travelling with his parents, Frederick and Augusta Goodwin and five siblings. The family was headed from England to Niagara New York. None of the bodies of the rest of Sidneys' family has ever been recovered so little Sidney lies alone in his unmarked grave. Read more about this story and view photos of Sidney as a baby and a group photograph of his family on Live Science. This Press Release intrigued me. Could genealogists utilize this app for iPhone or create walking genealogy tours? I'd love to hear from any readers who decide to apply - just post a comment here on my blog and let us know. Past Preservers is working with Crimson Bamboo to develop historical tours for iPhone app, Rama. Uniting popular history with archival photographs, Rama adds a historical narrative to the walking tour and shows snapshots of the tour route as it actually appeared. Named by BBC Travel in 2010 as one of the ten best new travel apps, Rama is the only app that captures the experience of being in Chicago after the Great Fire, on the beaches of Normandy during D-Day, or in Shanghai’s French Concession in the roaring 20s. Whether it’s a jaunt through your university’s past, or a recreation of the recent protests and political reform in Egypt, if you make the idea sound compelling, we’ll give you the tools to make it into a tour. April 20, 2011 – Austin, TX. The Federation of Genealogical Societies (FGS) announces the debut of My Society, the first Internet radio show dedicated solely to genealogy societies. Broadcast weekly each Saturday at 1:00 pm Central, My Society will host discussions of genealogy society topics with a variety of guests including well-known genealogists and genealogy community leaders. This unique media outlet can be accessed at http://www.blogtalkradio.com/mysociety. On Saturday, April 23, 2011 at 1:00 pm Central, Curt Witcher, Senior Manager for Special Collections at the Allen County Public Library, will be the special guest on My Society hosted by FGS board member Thomas MacEntee. Witcher, who is also a former president of both FGS and the National Genealogical Society as well as the founding president of the Indiana Genealogical Society, will discuss bringing genealogy societies into the 21st century. Each week, My Society will focus on a selected topic relevant to genealogy society management and the role societies play within the genealogy community. Future topics will discuss increasing membership, developing a social media and Internet presence, member services, and more. In addition, each episode of My Society will spotlight a member society of FGS and discuss their various programs and offerings. Using the Blog Talk Radio platform, listeners will not only be able to hear a live broadcast, but they will also be able to call in and speak with the show’s host and guests to discuss their own genealogy societies. Some of you may remember that a few years ago a very exciting discovery was made! A small girl named Alice was playing in the garden of an old house in England when she fell down a large rabbit hole. Before climbing out she made a unique discovery. In a small wooden box under a pile of rabbit fur hats Alice spotted a yellowed letter. The letter was addressed to "Dear Easter" and signed "Uncle Wiggily", and it provided details of an interesting family tree! Take a look at Easter Bunny's Family Tree chart and the letter to Easter Bunny from Uncle Wiggly. Easter Bunny hopped by my house today as he made his rounds and shared some new discoveries. 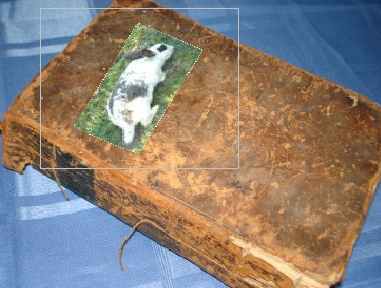 His great-grandma Bunny Fufu's bible has been found! Cousin Willy decided to downsize his warren and needed to get rid of items. So Easter was the lucky recipient of the treasured Bible. It even has a photo of Fufu on the cover! Easter couldn't stay long as he had a lot of eggs to colour and hide but he did show me the Bible and let me take a picture of it. Wow, what a lucky bunny! I wonder what he'll find in the next 12 months? From Theory to Fact: 30 Years in the Making talked about finding new information on my much-sought after McGinnis ancestry. One of the items I discovered in a newspaper obituary was mention of Bernard McGinnis' death in Colorado in 1902. That was pretty exciting as I had never been able to find Bernard in the Ontario Death Registrations and yet he should have been there. He and his family lived in Galt Ontario for over 20 years so I had assumed (note to self: never assume!!) he died there. I wondered what he was doing in Denver Colorado, so far from home. Colorado research isn't completely new to me as my husband's Massey ancestors left Canada circa 1880 and settled in Pueblo. Even though it is not his direct line, we always search all siblings down the generations in order to gain a more thorough knowledge of the family. We also hope to find out new details about the common ancestor using this method (searching all siblings). Crossing my fingers, I went to the online Colorado State Archives to see if Bernard McGinnis was in the death record indexes. Since I knew a month and year of death (October 1902) I could verify if more than one turned up. And there he was. My next step was to order a copy of the Death Record, which I was able to do online. There was no price given on the website but an email followed a few days later with details. It would cost me $25.00. Phew! That was a bit steep but I really wanted the record so I agreed. That was March 11 and finally on April 21st the record arrived at my home in Ontario Canada. No parents' names or locations of birth - such a disappointment! Turning my attention back to the obituary, I saw many other details that provided clues for further research as well as some puzzling items. One was the sentence that "The members of the CMBA turned out in a body and were augmented by about twnety visiting brethren from Hespeler." "CMBA was established for the purpose of joining fraternally in one grand organization all male Catholic between 18 and 50 able to pass a proper medical examination, to supply life insurance of $1,000.00 or $2,000.00 at actual cost to give social benefits only give by secret or fraternal organizations outside the Catholic Church, and to offset the work of secret societies"
Another bit of detail to make Bernard come alive for me. I've yet to explore the other clues in the obituary but I do recognize the names mentioned. I'm intrigued by the fact that there is no mention of his wife who was still living. And why was Bernard's body taken to his sister instead of his wife? I'll delve into that question at some future time. 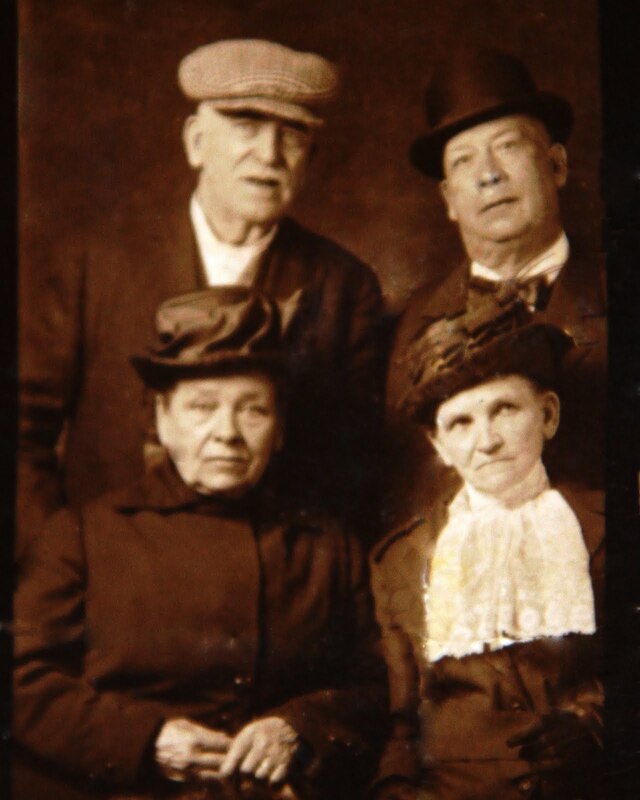 Here is a CDV (Carte de Visite) from the Fowler-Merchant Family Photo Album on Lost Faces. The Fowler Merchant Family Photo Album has slots for 30 CDVs (Cartes de Visite). 22 CDVs are identified by name. This is a Civil War Era Family Album with CDVs (Cartes de Visites), circa 1860s. Today I want to discuss Land Petitions. Every individual who believed they were entitled to a grant of land under Loyalist Regulations, had to file a petition with the Executive Council. In their petition the individual presented their case for receiving a grant. These Land Petitions often contain a wealth of genealogical information. The Petition of Storm Folluck Humbly Sheweth That your petitioner served as a Private in Col. Butler's Corps, that as yet your Petitioner has only drawn from His Majesty's 200 acres, most of which your Petitioner has improved, therefore prays your Honour will be pleased to grant him an additional 100 acres to put him on a footing with other soldiers of that corps. ﻿Some petitions are as little as one page outlining military service. Some are many pages long and often include affidavits from commanding officers testifying to military service. Sometimes affidavits or letters are included which outline personal hardships and suffering in the American Colonies - arrests, property seized, homes burned, etc. If an individual applied for a land grant as the son or daughter of an approved Loyalist, reference is made to the Loyalist parent. You never know what you will find in a petition until you read it. One of my Loyalist ancestors' petitions contained an affidavit outlining the hardships his wife and children suffered when their home in New York was burned to the ground by those opposed to the King. 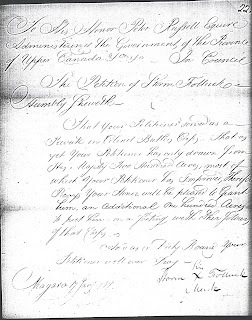 The affidavit on the left is for the same Loyalist ancestor but provides other details including the year his wife arrived in the Niagara settlement of Upper Canada. This affidavit also tells me that he was in Butler's Rangers from 1778 to the end of the war. The good news is that Library & Archives Canada recently indexed the Upper Canada Land Petitions and genealogists can now search the index on their site. If you find a name of interest in the index, be sure you copy the details exactly as you will need the microfilm number, Volume number, Bundle Letter and Number, and the Petition Number. The Volume, Bundle and Petition numbers and letters allow you to find the Petition(s) you want on the microfilm reel. You can order the Microfilm in to a Library or Family History Center. Remember that Upper Canada is now present day Ontario. Also it is important to note that the UCLP (Upper Canada Land Petitions) include petitions from individuals other than Loyalists. Once a petition was submitted, it was read in Council and a decision was made. Whether the individual's petition was recommended (approved) or denied is marked on the outside "envelope" of the petition. This is the dated Order in Council (OIC) and it will have a brief reference to how much land was granted and under what regulations, or the fact that the petition was denied. This morning my email contained a note from a woman who purchased an old photo album many years ago. This woman (who asked to remain anonymous) explained that she wants descendants to see the photos but wasn't sure how to share them. I was privileged to see copies of the photos, many of which are identified in period handwriting. I replied saying I would be pleased to host the images on my site Lost Faces with her name and email as a contact. I also began researching some of the names on the photographs. Okay I confess I am addicted to genealogy research even when it's not my ancestors! Imagine my surprise (and excitement) when she responded saying she would prefer to give the entire album and photos to me. Now, many of you know that I collect old CDVs (Cartes de Visite) from the 1870s and earlier. My personal collection of such photos now numbers over 3,500. That is only the CDVs. Many of these photos from antique albums are online on Lost Faces and more are being scanned whenever time permits. My goal is to scan my entire collection of CDVs, tintypes, Cabinet Cards, ambrotypes and daguerreotypes and publish them all online for all visitors to my site to copy and save for their own use. It is my hope that more photographs can be rescued and shared with descendants and that is why I am so thrilled that my new-found contact is such a generous soul. Some days become "feel-good" days when you meet someone with a caring and generous nature. Today is one of those days. Recently a cousin of my husband, Diana Bobo, sent hubs an email saying he has a connection to a man who died when the Titantic sank on April 15, 1912. Note that George was born in St. Mary's Ontario Canada which is where my husband was born too. Small world. He has ancestral ties there on both sides of his family tree, going back to the early 1800s when St. Mary's was first settled. Co-incidence? Or something else? In another odd twist, I too have a Titanic connection through William Thomas Stead who also was among those who died when the ship sank. This connection is through my great grandmother Sarah Stead who was born in England and is distantly related to William Thomas Stead. It's interesting to find out about these connections to a famous event or person. I bet we all have one or two. Recently I found an obituary in a Wisconsin newspaper for my son's great-grandfather Michael Niland. I didn't know too much about Michael before reading his obit, only that he was born in Ireland circa 1846, arrived in America circa 1870 and was married twice. I had his wives' names and the names of seven children. Michael's obituary was one of those finds that we all dream of - providing me with his County of origin in Ireland, his first wife's death (she was my son's great-grandmother), his year of immigration and confirming the names of five of his children. Those were the genealogical facts. But the obituary also included some descriptive text about Michael himself - his character and some interesting tidbits of information. We have to remember that an obituary is only as accurate as the knowledge of the person who wrote it. It's unlikely that Michael wrote his own obit so the newspaper account is suspect unless we can find evidence to support it. That's where the fun starts! The first hit was for Michael in the US Naturalization Records indexes on Ancestry.com . The index doesn't tell me much that is new, but it does provide information I need to send for his Naturalization records. He was born 23 June 1846 in Ireland, 66 years old, living in Wauzeka, applied at the courts in Prairie du Chien, Crawford Co. Wisconsin on 20 May 1913. His certificate number is F-23. I'll use that information to hunt or send for his papers. The next find was Michael age 34, his wife Mary and three children in the 1880 census in Marietta, Wisconsin. Here he is listed as a farmer which makes me wonder if there might be land records for him. His wife Mary is age 30 born Ireland so now I have an estimated date of birth for her of 1850. I want to check the image and not just the transcription because neighbours are sometimes relatives. Aha - living with Michael is a Thomas Niland age 36 born Ireland. I'm betting Thomas is a brother but I can't put that in my genealogy program without some proof. But it's a great extra bit of information as now I can look for Thomas as well as Michael in the records. I wasn't having much luck finding Michael in the 1870 census so there's a good chance he arrived after the census was taken. I didn't spend too much time searching for a ships passenger list but will do that another day. I did find evidence supporting the obituary claim that his first wife (Mary Brennon) died in 1889 although this record gives her date of death as 24 February 1889 which differs from the obit death date of 3 October 1889. I'll have to do some work to resolve that discrepancy. Next I plan to find Michael in 1900, 1910 and 1920 Census, plus look for his children in various online records. I'll also hunt for Thomas (in the 1880 census with Michael) and see if I can find his name on a passenger list on Ancestry.com , or in another census record. I'm looking forward to seeing what the new tests and upgrades reveal and will blog about it here. I've never blogged about the results of his original DNA test so that's also in the line-up. DNA is a wild and crazy thing to try to understand and I'm still in Kindergarten but I'll pass on everything I learned about my brother's paternal DNA test and results in a future blog post. Paternal DNA follows the male lineage and can only be tested on a male in the direct line. So to test my McGINNIS origins I had to get my brother to give up some spit. I'm not sure what the test will tell me so I'll post about my journey as it happens! The coupon code expires today ( Friday April 15) at midnight (CT). We talked about the history of Loyalists in Part 1 and today I want to talk about lands given to those who could prove they were Loyalists. This entry tells us that Cornelis received his land grant on 25 May 1793. Since I know his father was a Loyalist I also know that Cornelis was at least 21 years old in 1793. Therefore I know he was born 1772 or earlier. 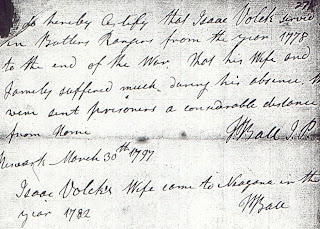 This also tells me that he submitted a petition to receive his Loyalist Land Grant, and so I need to look for that petition. I may get a surprise as it is possible he was applying for land in right of being a confirmed Loyalist himself and not just a son of a confirmed Loyalist. The Petition, if found, will have the information as to under what conditions he was applying. We'll talk about Petitions in Part 3. They are very important and can contain a wealth of genealogical information and detail. In Part 4 we'll discuss the various lists of Loyalists and why researchers should use caution when referring to them. Calling all Canadians & Americans - Does your family have British Roots? We’re currently making an exciting new TV series called Guess the Relative and it’s a fun and entertaining show all about family history and our distant living relatives. In it, people from around the world with get the chance to travel to Britain to discover living British relatives, who they never even knew existed. We’re currently looking for people from Canada who think they may have a distant ancestor from the UK. Their ancestor might be several generations back and come from England, Scotland, Wales or Northern Ireland - but if they have any link to the UK whatsoever, we want to hear about it! A British TV company is making an exciting new TV show featuring British families and their long lost Canadian and US relatives. Dragonfly TV is currently looking for Canadian and US families who would like to travel to Great Britain to discover long lost relatives they never knew existed. They’ll get to experience British life and stay in a magnificent Countryside home and meet new members of their family along the way. Now you can search and download First World War service records of RAF officers. 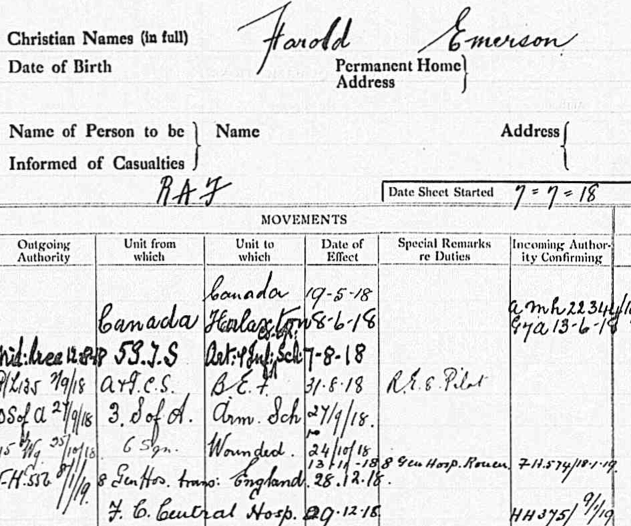 This database is of interest to Canadians whose ancestor may have enlisted in WW1 as a pilot. Canada did not have its own Air Force and any individual wishing to join the Air Force had to join the RAF. Approximately one-quarter of the aircrew in British Royal Air Force (RAF) squadrons were Canadian. A large RAF training establishment operated in Canada to produce new aircrew. Searching the indexes is free but to obtain full details a small fee is charged by the National Archives UK. 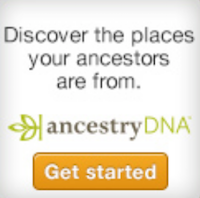 I tried this database earlier this morning with a generic search for my PEER ancestors. Because I search for all PEER individuals in North America, it's always of interest to me to see if one of them can be found in any new database online. I'll explain how to read and understand these Service Records in a separate blog post. Please watch for it here! 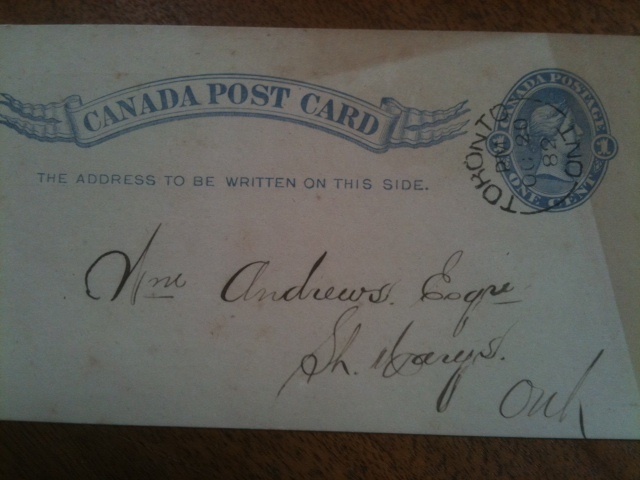 "Soliciting a Continuance of Your Esteemed Patronage...."
My husband collect ephemera from St. Mary's Ontario Canada. One of his recent acquisitions was hundreds of miscellaneous documents from Andrews Jewellery Store. The documents date from 1870 to 1900 and remained in the Jewellery Store until quite recently. 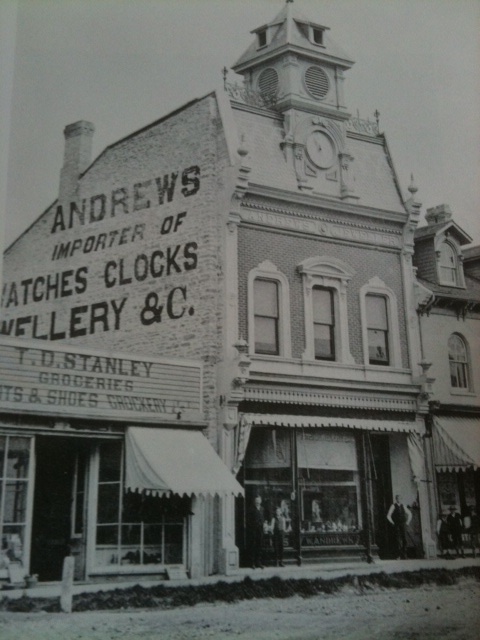 William Andrews built his Jewellery store in 1884 and one of my husband's ancestors Fred Massey, worked as a jeweller for Mr. Andrews in later years. 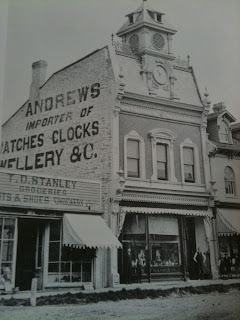 The store is still in St. Mary's at its original location and still operates as a jewellery store. William Andrews died in St. Mary's in 1927 at the age of 83. William's father Henry Andrews was a Stone Mason from Devonshire England who came to Canada West (present day Ontario) in 1855 and William apprenticed as a clerk for a jeweller in St. Mary's before opening his own store. 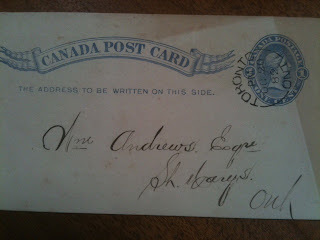 Part of my husband's collection consists of Post Cards sent from businesses and stores all over Canada to Mr. Andrews. These are not Post Cards as we think of them today. They are receipts for money paid by Mr. Andrews for goods and services. This image shows one from Toronto and dated October 20, 1882. 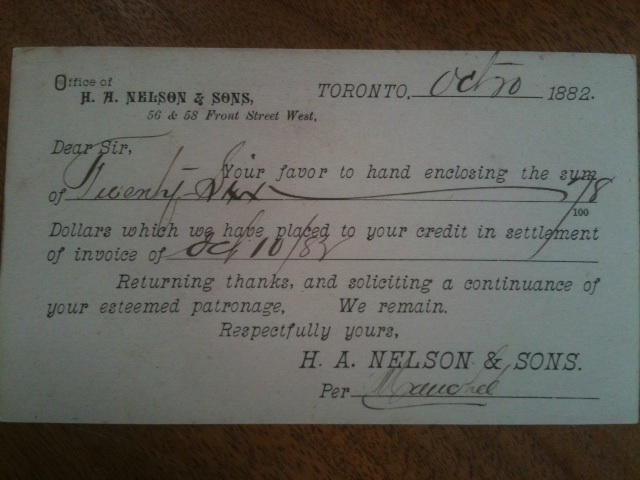 It is from H. A. Nelson & Sons on Front Street West. A check of Google books revealed that H. A. Nelson sold brushes and brooms. "Dear Sir - Your favor to hand enclosing the sum of Twenty-Six /78 Dollars which we have placed to your credit in settlement of invoice of Oct. 10/82. 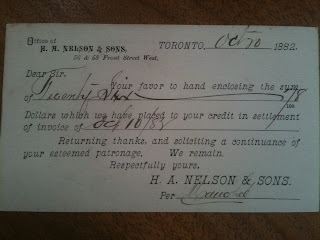 Returning thanks, and soliciting a continuance of your esteemed patronage, We remain Respectfully yours, H. A Nelson & Sons"
Reading through some of the hundreds of documents is delightful and jolts the reader back to another time where courtesy abounded and flowery language was the norm. When the American Revolution (Revolutionary War) began in 1775, individuals living in the 13 British colonies had to decide whether to remain loyal to the British King or to fight for independence. Loyalist is the term used to describe those who supported the King and who later fled to Canada with their families. You may sometimes see Loyalists referred to as Tories but this is not the commonly accepted term. "[he] suffered greatly both in his person and property in the Late War between Great Britain and America"
The first trickle of Loyalists into Canada was in March 1776 when 1 000 people fled Boston and accompanied the British Army as it retreated before the American forces. In 1782 when the Revolution ended, Canada consisted of two colonies: Quebec and Nova Scotia. Approximately 10,000 Loyalists went to Quebec, the rest to Nova Scotia. Those who settled in Quebec ran into problems with the French feudal system of land ownership and agitated for the creation of an English-speaking province. As a result, the Quebec colony was divided into Upper and Lower Canada in 1791. Loyalists came overland to the Niagara Peninsula in the new area of Upper Canada. I'll discuss Loyalist Land Grants, Land Petitions, Rationing Lists and other available records and information on Loyalists in subsequent blog posts. It's the final episode of Season 2 of Who Do You Think You Are? tonight April 8th. Ancestry.com has once again partnered with NBC in Season 2 of Who Do You Think You Are? You won't want to miss tonight's episode with Ashley Judd as she follows her ancestors to England and the Pilgrim Fathers. The program airs at 8 PM Eastern time, 7 PM Central. I hear via the grapevine that there is also a Civil War ancestor hiding in Ashley's lineage. I'm texting my hubby to bring home potato chips and pop for tonight's tv watching! Labels: WDYTYA, Who Do You Think You Are? Free Access to Civil War Records on Ancestry! Starting Thursday, April 7th and running through the following Thursday April 14th, Ancestry.com will be featuring a week long promotion to commemorate the 150th Anniversary of the beginning of the U.S. Civil War. Ancestry.com is offering Free Access to all Civil War records during the promotion! There's been a lot of discussion about clouds recently. Cloud computing that is. Are you in the cloud? I am and it's not only easy, it's fun and a great way to save and share important things. Got a new find in your genealogy research and want to have multiple copies in safe places? Typed out great-grandma's recipe and want to share it with your cousins? Scanned 100 old family photos and want to make sure you have backups? Need to work on a project in collaboration with others? At your hotel for a genealogy conference and just remembered you left your notes at home? Don't worry, the cloud has your back! What is it and Why Do I Want It? There are many different types of cloud computing and several models of use, but I just want to describe the cloud services I use and how and why I use them. You can Google "cloud computing" to read detailed definitions and descriptions. My all-time favourite and most-used cloud service is Dropbox. With Dropbox I can store, sync, and, share files online for free. Not all cloud services will sync. If that's not important to you, don't worry about it. But I like to have at least one service that will automatically sync my uploaded files to all my devices. Here's a brief look at how Dropbox works. Let's take an example of writing the story of Grandpa Harvey's life. I've saved my file to my computer hard drive but I want a backup and I want to be able to work on the story from my iPad, iPhone, Blackberry, Android, Laptop or other computers. All I need to do is "drop" my file into my Dropbox Account (2 GB of free storage space). Dropbox automatically syncs the file to all my devices that have the App installed. I can also access the files from any computer simply by going to the Dropbox website. I can also give other family members or contribuotrs access to the file and they can participate in the story writing, or simply enjoy reading it. With Dropbox I can take a photo from my iPhone camera and immediately send it to Dropbox. When my husband is out photographing cemeteries for our Cemetery Walk series on Olive Tree Genealogy You-tube Channel, he can send each photo as he takes it to Dropbox. Dropbox notifies me on all my devices and my main computer immediately that a file has been added to my space. That gives me immediate access to the tombsotne pictures hubby is taking. 2GB of free storage plus ability to earn extra free space up to 8GB. No size limit on files. Sync files automatically. Available as an App for iPhone, iPad and other mobile devices. Able to access files from any computer (Mac, Windows, Linux) or mobile device. Sign up for your free Dropbox Account of 2GB and get an extra 250MB free through this link. 5 GB free storage. Does not sync. Access files from any computer. Amazon promotes their cloud storage as a great way to save videos, music and photos. 5 GB is about 1,000 songs, 2,000 photos or 20 minutes of videos. When you purchase songs or albums from the Amazon MP3 Store, you can save your purchases to your Cloud Drive. 25GB free storage but file sizes limited to 50MB. Create, view, edit, and share Microsoft Word, Excel, PowerPoint, and OneNote files online with SkyDrive even if you don't have Microsoft Office installed on your computer. Note: I find Windows SkyDrive slow but I love the online Excel and Word programs! It allows me to use my familiar Excel and Word even on my MacBookAir. 1GB free. With Google Docs you create and share your work online. Each of the free cloud storage services above with the exception of SkyDrive allow users to pay for expanded storage and more features. Why do I use so many? I like to keep my cloud storage semi-organized by type of files or work. For example I use Amazon Cloud Drive for my scanned photos. I use DropBox for files I'm actively working on and files I need to easily and quickly share between computers. I use Memopal for backup storage of my main website Olive Tree Genealogy. Box.net isn't one of my favourites but it's useful for backup of final versions of the Family History books I've published. It's downfall is the small file size it allows. I'm not a huge fan of Google Docs so hardly ever use it but I include it here because it is good for teamwork participation. Windows SkyDrive is one I'm just starting to explore and I love being able to work in Excel and Word from my MacBook Air, but I find it the least user-friendly. You can read what PC World had to say about Google Docs vs SkyDrive vs Amazon CloudDrive. Spoiler: The author likes Box.net the best. Don't ask me how that got into the mix when the title is "Cloud fight! Amazon Cloud Drive vs. Google Docs vs. Microsoft Skydrive"
My personal choice for my top three cloud services are Dropbox, Memopal and Amazon CloudDrive. Try them. See which one works for you! Don't forget to use these links for Dropbox and Memopal to get your extra free storage space when you join! You won't be sorry you dipped your toe into the cloud. The Archives of Ontario has completed microfilm of Vital Statistics records from the Office of the Registrar General for the 1913 birth, 1928 marriage, and 1938 death indexes and registrations. Consisting of over 127,000 scanned images, the microfilm and its related finding aids are available at the Reading Room at 134 Ian Macdonald Boulevard in Toronto, Ontario, on York University's Keele Street campus, and at local libraries through the Interloan program. 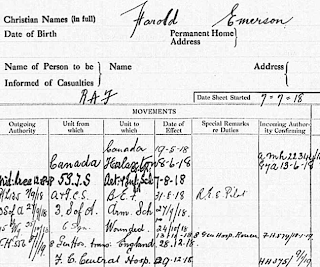 The Vital Statistics records for 1914 birth, 1929 marriage, and 1939 death indexes and registrations, are currently being scanned and the resulting 130,000 images checked for clarity and completeness. Ontario Archives is working to have these records available online in a searchable format in 2011. They also hope to make the 1915 birth, 1930 marriage, and 1940 death registrations available later in the same year. As the work progresses, further details will be released through Archives of Ontario website. The Peer family left New Jersey to settle in Ontario Canada in 1796, after the Revolutionary War. 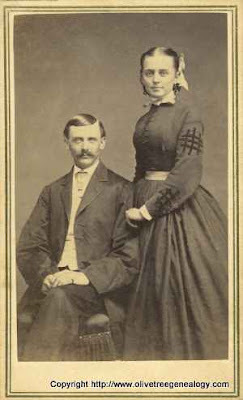 Jacob and Anne (aka Hannah) Peer had several children born in New Jersey (Levi, John, Edward, Philip, Phoebe, Marcy, Jacob and Stephen). Their descendants settled in Michigan, Pennsylvania, Illinois and Ontario Canada. I have been researching all branches of this family for over 30 years and last year I published Volume 1 of a planned series of books on the family. The following brief excerpt is from my book The Peer Family in North America. V1 Jacob & Anne Peer, Immigrants from New Jersey to Upper Canada in 1796. A study of the first two generations. published June 2010. Jacob Peer, the immigrant ancestor to Ontario, left New Jersey for Upper Canada (present day Ontario) thirteen years after the American Revolution ended in 1783. The American Revolution began in 1773 and during this time New Jersey was a hot bed of political and military upheaval. "[Jacob] suffered greatly both in his person and property in the Late War between Great Britain and America". Jacob remained in New Jersey until the summer of 1796 when he and his family and at least one adult son Philip (and his family) left for Upper Canada. Subsequent volumes are in process for each individual in Generation 2 (Jacob & Anne's children) and their descendants. Peer descendants will want to purchase Volume 1 plus any Volume(s) containing details and records of their next ancestor and descendants. Use this link to place an order through Paypal or download an order form for your copy of The Peer Family in North America. V1 Jacob & Anne Peer, Immigrants from New Jersey to Upper Canada in 1796. A study of the first two generations. Interested descendants may sign up for notification of publication and updates by writing to PeerFamilyBookATgmail.com (replace AT with @) Please include your name, and the Volumes you are interested in. 'ENRICHED THE COFFERS: Gideon Peer, Robert Simpson and Chas. Emslie, all on the Indian list, were each fined $10 and costs at the police court this morning. Abe Summerville, also on the list, pleaded not guilty, and his case will be disposed of tomorrow morning"
That was it. No explanation as to what the fine was for and no details as to what this "Indian List" was. I'd never heard of such a list before. As far as I knew, my Peer ancestors were not of native heritage. But could I be mistaken? Wouldn't an "Indian List" be a list of natives, those known to be of native blood? I remembered that Gideon's father Levi Peer, in a letter written to his mother Elizabeth Marical Peer in the 1840s had referred to his Irish born wife Jane as a "squaw". In the next sentence he'd added that Jane was "Irish to the bone" so I'd dismissed the use of the term "squaw" as simply some kind of local colloquialism. I also recalled that one branch of the family descended from Elizabeth Marical Peer insisted she was a native, part of the Mohawk Marical family in Ontario. Although I had found no evidence of this in my research and in fact I linked her to the Palatine family of Merckel aka Merkely aka Marical. Now I questioned my research. Perhaps I'd overlooked something. So I went back and pulled out all my notes on Gideon and his sibings and parents. No reference to native heritage in any of the census records. No reference to it in other sources. I decided to search for the men listed in the newspaper account - Charles Emslie, Robert Simpson and Abe Summerville. Perhaps something found in records for these men would provide a clue. and a cached version of an article titled "Are You on the Indian List" published in 2008. Apparently in 1876 a change in the Indian Act made it illegal for natives to purchase or possess alcohol. Names of natives were compiled on an Interdiction List which became known as The Indian List. Saloon keepers, hotel owners, and bars had copies of this list and they were not legally allowed to sell to anyone whose name was on the list. That still did not explain my Gideon Peer appearing on such a list. But I learned that rather quickly non-natives were added to this list. Thus anyone, white, native or otherwise, who was a habitual drunk or had been in trouble with the law due to being drunk and disorderly, had their names added to this list. It then became illegal for them to purchase or own liquor or to have a drink in a tavern, hotel or bar. Failure to comply with the regulations meant a fine either for the person on "The Indian List" or the person selling the liquor to them. I must confess that finding out about this "Indian List" shocked me. Such a list could only lead to prejudice and social classifcations that were applied to all natives. Assumptions had to be made in the first place that no native was to be trusted with alcohol! This would have affected social expectations and views of the native population. Adding the names of non-native individuals who had been found drunk and disorderly would only further add weight to the notion that a native was automatically assumed to share that classification. As a Metis (of native and French descent) I'm appalled that this existed in our country. I recognize that it was a product of the times but it doesn't make the law or the list any less a social injustice. What did I learn about Gideon? He wasn't a native but apparently he liked his liquor and was prone to being charged with drunk and disorderly conduct. His family must have been mortified to see his name in the newspaper and the mention that he was "on the Indian List". Tonight's the night! Who Do You Think You Are re-runs are over and tonight's episode is brand new. Ancestry.com has once again partnered with NBC in Season 2 of Who Do You Think You Are? Gwyneth Paltrow is featured tonight in Episode 7. Tune in at 8 p.m. tonight, Friday April 1st to see what exciting ancestors Gwyneth discovers as she journeys to Barbadoes in search of her ancestry. Season 2 consists of 8 episodes featuring Gwyneth Paltrow, Tim McGraw, Rosie O'Donnell, Steve Buscemi, Kim Cattrall, Lionel Richie, Vanessa Williams and Ashley Judd in their search for ancestors.